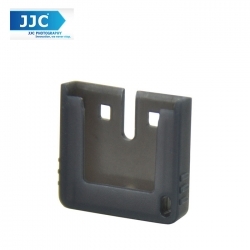 JJC HC-SP connector protect cap is designed for devices that have multi interface foot (called “MI foot” in the following) for Sony MI shoe such as flashes, microphones, video lights etc. Exposed terminal of MI foot is damaged easily. Just attach it to the terminal of MI foot of your device, and the terminals will be protected against scratches, dust, moisture or other damaging elements, thus prolonging their effectiveness. The cap is easy to install and remove. When a hot shoe flash or other camera accessory fitting multi interface shoe is not in use, you’d better put the cap on and thus store them in good condition.